We’ve been covering the attempts across the country to turn smart meters, in-home wireless gateways and pre-programmed, price-sensitive thermostats into real-world peak power demand reduction across tens of thousands of homes. Most of these smart-grid-enabled projects are small-scale, meant to prove the costs and benefits of going full-bore with the next generation of utility-to-customer energy engagement. Amidst all the pilots, however, we’ve seen certain utilities and regions take the next step into commercial-scale deployments. Those have been driven by regulation and mandate in some cases (Canada’s Ontario province is a good example of that case), or via a combination of technology mandates and competitive energy markets, as in Texas and the U.K. But in other cases, internal economic considerations can make the smart-meter-to-home energy connection worthwhile on its own merits. 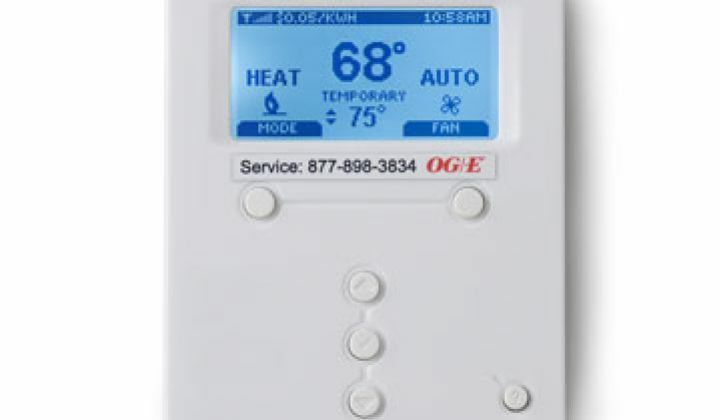 That’s the case that Oklahoma Gas & Electric is seeking to prove out with its Silver Spring Networks smart meter network-enabled, Energate smart thermostat controlled, variable pricing program-based residential demand response program. On Monday, OG&E partner Energate announced some results from last year’s deployment, its first season at commercial scale, that should prove interesting to other utilities trying to get homeowners to shave peak power on hot summer afternoons. Over the course of the year, the program managed to sign up about 40,000 homeowners to go to a rate plan that charged more on weekday afternoons in exchange for cheaper off-peak rates, and also provided them each a free smart thermostat. Not only did the program manage to save participants money -- an important consideration for getting more people to sign up -- it also managed to deliver a collective 70 megawatts of peak power reduction, or about 2 kilowatts per home. That’s an important number, because it’s quite a bit higher than the 1 to 1.3 kilowatts per home that the partners were aiming at when they started, Energate CEO Niraj Bhargava said in an interview. Those lower figures are based on general industry understanding of what other projects that include real-time pricing information and preset, automated home energy controls can achieve, he said. In OG&E’s case, the costs of the program, which including the smart meters and thermostat giveaways add up to $300 to $400 per home, they are more than offset by the avoided costs of new coal or gas-fired generation to meet those peak power needs, according to OG&E's plan. Beyond sheer load reduction, OG&E was also able to get reliable and steady reduction out of those collected homes, he noted. Energate’s SmartHours program allows customers to choose various comfort and cost settings via web portal or on their thermostat, as well as adjust settings based on data collected over time. As for the underlying smart meter network, it's built out via a $130 million Department of Energy stimulus grant. OG&E wants to sign up another 40,000 residential customers and get another 70-megawatt peak load reduction out of them this summer. The utility has a 2014 goal of 120,000 homes and is working with other partners, such as Silicon Valley big data smart grid startup AutoGrid, to fine-tune the program’s customer outreach and program design. Of course, there are other ways to get homes to reduce peak energy use without installing smart meters that talk to devices in the home. Arizona utilities like APS and SRP have been offering time-of-use pricing programs, enabled by programmable thermostats from Honeywell that have delivered reliable results without smart meters. Startup Opower has shown reliable, if slight, peak load reductions driven by the behavior-science-driven consumer engagement programs it runs for big utilities across the country. Still, the combination of automated energy control and significant price differentials have shown to be the most effective way to get lots of homeowners to shift their energy use in a major way. State regulators in California, Illinois and elsewhere are starting to require big utilities to hook up the millions of smart meters they’ve installed to their customers at large. We’ll get to see a myriad of technologies, pricing programs and regulatory mechanisms contend this summer -- stay tuned for more results like OG&E’s to come.